OK so before I explain my rather excessive title, a bit of a confession. Some of you have probably already noticed but this number is the one that appeared on numerous occasions in Lost; not sure if that’s any sort of omen or not but, there, it’s done and out in the open. If you did recognise the number give yourself 100 JaseClarke_CX points! There can’t be that many, can there? Has someone really published a list that long? And counted them? So what’s the point of this far-fetched title? I started to wonder exactly how many steps/pillars/ways I’d come across – there are a lot. For a brief moment I did think I could go back through my twitter feed to add up all numbers in the kinds of article – one day I might, if I can figure out a way of doing it easily. Whatever the real number, there seems to be an unending supply of articles/blogs that have such a title. Don’t get me wrong, some of these articles are really good and there’s some really good hint’s and tips available out there. That said I believe that all these suggestions on improving the customer experience boil down to just one simple thing. Common sense – but it’s rarely applied. My brain hurts everytime I see “X” ways of doing anything. As you said so well, they present some good ideas, but mostly are headline hooks to get you to click and read. Most of the content is recycled or restated, why because people continuously need reminding. Tattoo it on their foreheads and they would still forget it. By the way that is a picture of ‘Deadpool’ the anti-hero psychotic mercenary with super agility and healing factor. 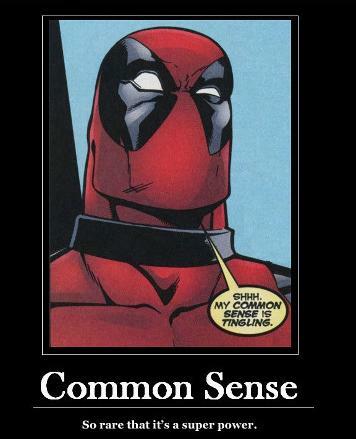 The tongue was planted firmly in cheek when the image was used with any phrase including ‘Common Sense’. Thanks Allen – tattooing ‘Common Sense’ seems like a good idea to me!. PS I bow to your superior knowledge of Marvel comic books!